Pre-heat the oven to 350°F. Grease a 10-inch round terracotta baking dish or cake pan with butter. Sift the flour and baking powder together in a mixing bowl. Add the salt and set aside. In a standing mixer fitted with a paddle, beat the eggs and 1 cup of the sugar until creamy. Add the milk, melted butter, and vanilla. Slowly add the dry ingredients until completely incorporated. Spread the batter three-quarters-inch thick in the prepared pan. 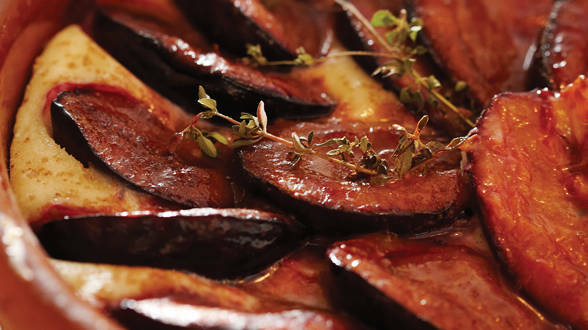 Arrange the plums evenly on top of the batter and sprinkle with the remaining 1/2 cup sugar mixed with the cinnamon. Bake for 25 minutes, until a cake tester or a knife poked in the center comes out clean. Garnish with some fresh herbs and serve with a scoop of vanilla ice cream, if you like. In Recipes-list.com we have selected the most viewed recipes from category - uncategorized . Enjoy the best recipes specially selected for you! Plum Cake is the right choice that will satisfy all your claims.